AMMONNEWS - Restaurants around the globe are embracing technology in a big way to cater to the demands of its new generation customers. The trend has reached India, too, where tech-savvy restaurants all over the country are trying to excel in delivering “unique and innovative” theme-based dining experiences and entertainment. The rage for robot restaurants seen in countries like Singapore, Japan, China, Bangladesh and some western countries has prompted a team of youngsters in India’s Tamil Nadu to get into this enterprise. Blending the latest technology with cuisine was witnessed in Tamil Nadu with two “robot restaurants” being launched, eight months apart, first in Chennai and later in Coimbatore recently. In April last year, BoB – an Indian-designed robot prototype, was set up by VR Mall and demonstrated in many Bangalore restaurants as a precedent to explore the use of robots in food-serving techniques. The “robot-restaurant” opened in Chennai in mid-November last year claims to be the first-of-its-kind in India. The restaurant earlier called MOMO was re-launched by co-owners Venkatesh Rajendran and Karthik Kannan in a robotic theme to deliver “novel and entertaining” experiences to their customers. “I wanted to set up a restaurant different from others. So, I came up with an innovative concept of robots as waiters. This robot-themed restaurant in Chennai utilizes four ‘robot waiters’ to serve 70 seated patrons,” Venkatesh Rajendra told Al Arabiya English. 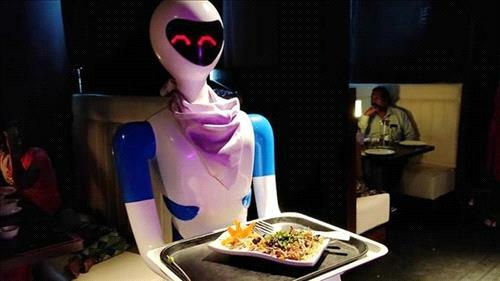 Following the success of their pioneering venture, another franchise robot restaurant was opened in the textiles city of Coimbatore in July this year catering to 140 people and using 8 ‘robot waiters’. All these robots are, however, imported from China and Japan where Venkatesh Rajendran also underwent robotic technical training to learn their operation, repair and programming. Venkatesh calls the response to these restaurants “very enthusiastic”. “The one in Chennai caters to Chinese, Indian and Thai cuisine while the Coimbatore one caters to multi-cuisine palate. There is a plan to open another franchise outlet in Bangalore in the coming months,” he said. These “robots” are battery-operated and can be controlled by sensors. Each robot waiter is programmed to carry the food-trays from the kitchen to the designated customer table and to return the dirty dishes back to the kitchen. These “robot waiters and waitresses” are elegantly attired and move on predetermined paths across the eateries; halting whenever obstacles are encountered. Their eye sensors reflect annoyance when unnecessarily obstructed and they voice their request to keep their paths clear. These robots understand English and Tamil and are programmed to cheerfully greet the patrons at their tables. Both the restaurants have an exotic dim-lit ambience with neon robotic figures painted on the walls all around the restaurants; complimenting their robotic-theme prominently. Each table, allotted to a customer at these two restaurants has a phone tablet displaying the menu on which the customers can place their orders which are linked to the kitchen. The chefs in the kitchen prepare the orders and place them on the tray-laden humanoid waiters who take them to their respective tables. Although the actual serving of the food at these tables and later their cleaning-up is done by human waiters, the customers are all excited and enraptured by their close encounters with the “robot waiters”. The human waiters hovering near the tables also explain the varied menu in detail as per customer request. The “selfie corners” in both the restaurants are a major attraction and people from all age groups hover around here to capture their “selfie moments” with these unique waiters. The robot restaurants in Chennai and Coimbatore have become popular hangout places especially for birthdays and other celebrations of both the young and old. With delicious food and reasonably priced menu coupled with the novel androids; these restaurants are running full houses and getting raving reviews. Prior reservations at these restaurants are strongly recommended to ensure seating and minimize the waiting period. The resounding success of these restaurants could very well result in interactive robots and humanoids becoming a common sight at the food joints across India.